I think I have the 2003, 2004 and 2007 like everyone else no doubt... in the off chance I can make it I have those. Wonderful idea though. W/c 11 Nov would be my vote. Would give us plenty of time to source the bottles and have them delivered to the B&F. I am hoping that I will have had the summer season at the B&B and able to come to London for a few days for some port so would like to be added if possible please. Life is such an ever changing complication at the moment. I would love to be there to celebrate another fine year for DRT but it seems unlikely that will be possible. Could I please go on a reserve list for now just in case I manage to get a pass. I am guessing that this emergency has been postponed. I might make it for a glass or two/three if it does go ahead but unlikely for a full tasting as I am out during the day. I hope your M-i-L has a good evening whether it be the B&F or not. What a line up! Was Tom only allowed 3 voting points? Topic: Tue 29th October 2019 - "69"
I would like to keep my name down for Quinta do Cachao Vertical whenever it is scheduled but will skip the now proposed 70s theme for this date please. I am afraid I am sorry too. Unless anyone can volunteer to look after Zac, I can not make it tomorrow either. Very disappointed as I always try to make a point of a wet January. I hope you enjoy some fine juice. 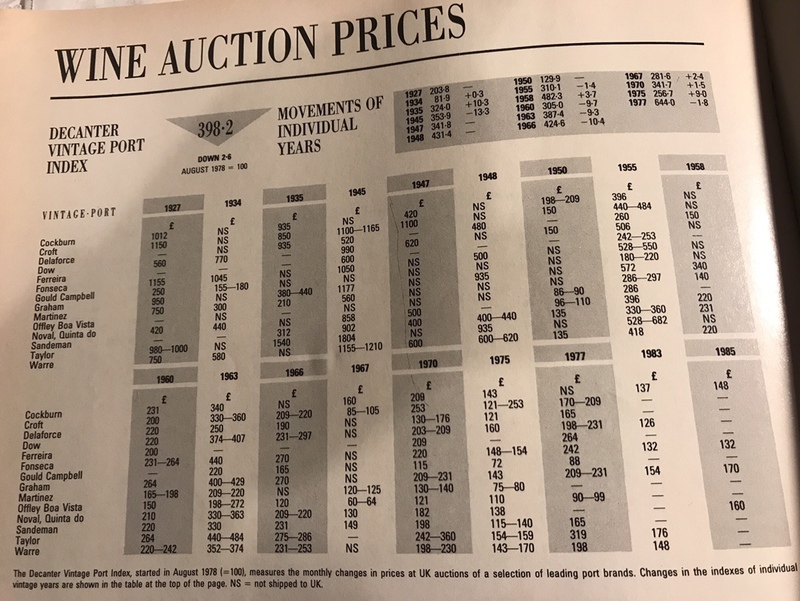 Here is the list from the December 1983 Decanter. I will try and get to the others ASAP. Can I please put myself down as a maybe. Congratulations to all of the members of The 18% on your Silver Jubilee! And a huge thank you for your fine website and sharing all your Port tasting notes and information. Warre 2016 VP @ 14 and Taylor 2016 VP @ 23 on the list are the only Ports to make it this year. Maybe it is a secret lucky sign and if you contact Warre they will send you the rest of the pipe! Still a reserve hoping to be promoted to the main list, but will just be pleased to be around to read the tasting notes in all honesty.